The ICC is sponsoring an End of Summer Tour to Ireland (September 2 – 12, 2017): Visiting Dingle, Kilkenny and Dublin. Please join us for an information session on Sunday, January 22, 2017 at 1:00 pm, in the Dooley Campus Center at Elms College (Room 207), 291 Springfield Street, Chicopee, MA. Learn more about this exciting new tour. Spend an afternoon of Irish fiddle and folk music with House of Hamill, the duo of Brian Buchanan (of Enter the Haggis), and Rose Baldino (of Burning Bridget Cleary). This duo proved extremely popular in their last appearance for the ICC. Their intimate, relaxed performances have been extremely popular, and will include trad Irish sets and songs, and new, original compositions. House of Hamill will perform on Sunday, February 19 at 3:00 pm at the Collegian Court Restaurant, 89 Park Street in Chicopee, MA. Tickets are SOLD OUT, and will not be sold at the door. Thank you for your support. Learn more about this event! The ICC is sponsoring an End of Summer Tour to Ireland (September 2 – 12, 2017): Visiting Dingle, Kilkenny and Dublin, Ireland's Three Gems. Please join us for an information session on Sunday, February 26 at 1:00 pm, in the Dooley Campus Center at Elms College (Room 207), 291 Springfield Street, Chicopee, MA. The tour is limited to 45 passengers and will be filled on a first-come, first-paid basis. Learn more about this exciting new tour. Join the Springfield Symphony Orchestra in a Celebration of Irish Culture with An Evening with The Irish Tenors, on Saturday, March 4, 7:30 pm. Don’t miss the pre-concert discussion lead by Congressman Neal on the Easter Rising of 1916. Supported by the Holyoke St. Patrick Day Parade Committee, an SSO community partner, and the Irish Cultural Center of Western New England, an SSO affiliate. Learn more. The ICC is sponsoring an End of Summer Tour to Ireland (September 2 – 12, 2017): Visiting Dingle, Kilkenny and Dublin, Ireland's Three Gems. Please join us for an information session on Sunday, April 2 at 1:00 pm, in the Dooley Campus Center at Elms College (Room 207), 291 Springfield Street, Chicopee, MA. This tour is now sold out - please contact us to be placed on a waiting list. We will still be hosting this information session for anyone who is interested. Anna Ní Choirbín will present a talk on An Introduction to Irish Drama on Thursday, April 20 at 7:00 pm in the Alumnae Library theater at Elms College. Anna is the current Irish Fulbright Foreign Language Teaching Assistant at the college. This event is free and open to the public. Learn more. The ICC invites you to an afternoon of Celtic music with Searson, known for their own original music from Canada’s Ottawa Valley, mixed with Celtic, East Coast, and Scottish. Their performances feature high energy fiddling, vocals and step dancing. This is a benefit show for the Irish Cultural Center’s library and museum. Searson will perform on Sunday, April 30 at 4:00 pm at the Holyoke Elks Lodge, 250 Whitney Ave, Holyoke, MA. Doors open at 3:00 pm. Cash bar available. Tickets are general admission, table seating. Cost is $20 for ICC Patrons, $23 for general public, $25 at the door. Receive a 10% off coupon for the ICC’s new Irish House Restaurant with each ticket purchased. Tickets are available online or by calling the Irish Cultural Center at 413-333-4951. Learn more about this event! The ICC is sponsoring our sixteenth Irish language immersion day, Lá na Gaeilge. It is a unique opportunity for those with an interest in the language - beginners and those with varying levels of competence - to deepen their knowledge and appreciation of this vital component of Irish culture. Learn more and download a registration form. Join us for music in the Trinity Pub on Friday, May 19 at 7 pm. Reservations are strongly recommended! Please call 413-342-4358. Pat Kelleher, from Co. Cork, is an accomplished musician and singer who has been performing for over 30 years. He is acclaimed in Ireland and abroad for his folk singing and five string banjo playing. 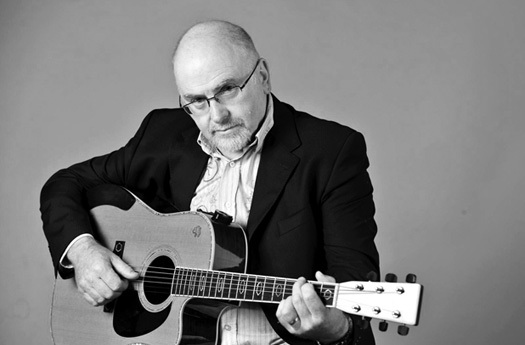 Folk singer and balladeer Dan Ringrose will provide live Irish entertainment at the ICC's Irish House Restaurant and Trinity Pub, on June 17 from from 7 – 10 pm. Please call for dinner reservations: 413-342-4358. Balladeer Dan Ringrose was raised on the music of Irish folk legends The Clancy Brothers and Tommy Makem. He has been performing professionally throughout the region and beyond for over thirty years. From Vermont to Gettysburg to Nashville and across the pond, Dan with his warm rich baritone has delighted audiences with stories, poetry and songs of the Emerald Isle. More info about Dan. Watch a video clip. Folk singer and balladeer Dan Ringrose will provide live Irish entertainment at the ICC's Irish House Restaurant and Trinity Pub, on July 15 from from 7 – 10 pm. Please call for dinner reservations: 413-342-4358. Mayor Will Reichelt and former Mayor Ed Sullivan of West Springfield will be serving drinks and assisting in house bartenders with hospitality on Thursday, July 20 from 5:30 – 7:30 pm, at the ICC's Trinity Pub. Come join your friends – they will wait on you! Any tips or donations made to these bartenders will be used to help finish building the ICC's library and museum. Thank you for your support and we look forward to seeing you! The Irish House Restaurant serves dinner from 5:00 to 9:00 pm – please call 413-342-4358 for reservations. Local favorites Don and Sheila Healy provide live Irish music on Saturday, July 22 from 7:00 – 10:00 pm in the ICC's Trinity Pub. The Irish House Restaurant serves dinner from 5:00 to 9:00 pm – please call 413-342-4358 for reservations. Celtic Adventures for Kids is a week-long program designed to give children an introduction to the richness of Irish culture. Children from grades 1-9 take part in several classes daily, including: Irish dancing, music (singing Irish tunes, playing the tin whistle and the bodhrán), Irish language, storytelling/literature, games, and arts and crafts. The Maguire Center swimming pool is open daily. Camp runs July 24 –28, 2017 from 9:00 am to 3:00 pm. Learn more and download a registration form. Henry Downey, VP Florence Savings Bank and Jimmy Leydon, new ICC Board Member, will be serving drinks and assisting in-house bartenders with hospitality on Thursday, July 27 from 5:30 – 7:30 pm, at the ICC's Trinity Pub. Come join your friends – they will wait on you! Any tips or donations made to these bartenders will be used to help finish building the ICC's library and museum. Thank you for your support and we look forward to seeing you! The Irish House Restaurant serves dinner from 5:00 to 9:00 pm – please call 413-342-4358 for reservations. The Bards provide live Irish music on Saturday, July 29 from 7:00 – 10:00 pm in the ICC's Trinity Pub. Jimmy McArdle, an original member of the Irish folk band The Bards, has performed with many well known acts such as The Clancy Brothers and The Wolfe Tones. He has also played alongside world renowned flutist James Galway at the famous Black Rose in Boston. Jimmy continues to perform in Western Massachusetts, Cape Cod and throughout the Boston area. He often teams up with the area’s finest musicians, including Bellaghy native Barney McElhone and Holyoke’s accomplished accordion player Jerry Murphy. The Irish House Restaurant serves dinner from 5:00 to 9:00 pm – please call 413-342-4358 for reservations. This week's Celebrity Bartenders – Dee Reilly, local Irish musician, who we are pleased to have playing at the Trinity Pub in September; and Caroline M. Murray Esq, B.A., Elms College J.D., Barry University School of Law, Orlando, Florida, who also has her own law firm. These lovely ladies will be serving drinks and assisting in-house bartenders with hospitality on Thursday, August 3 from 5:30 – 7:30 pm, at the ICC's Trinity Pub. Come join your friends – they will wait on you! Any tips or donations made to these bartenders will be used to help finish building the ICC's library and museum. Thank you for your support and we look forward to seeing you! The Irish House Restaurant serves dinner from 5:00 to 9:00 pm – please call 413-342-4358 for reservations. The Cabeys provide live Irish music on Saturday, August 5 from 7:00 – 10:00 pm in the ICC's Trinity Pub. The Cabeys are a long standing local trio playing traditional Irish favorites as well as contemporary Celtic. The Irish House Restaurant serves dinner from 5:00 to 9:00 pm – please call 413-342-4358 for reservations. This week's Celebrity Bartenders, West Springfield's City Councilor Brian Clune, and Attorney Sean Powers, will be serving drinks and assisting in-house bartenders with hospitality on Thursday, August 10 from 5:30 – 7:30 pm, at the ICC's Trinity Pub. Come join your friends – they will wait on you! Any tips or donations made to these bartenders will be used to help finish building the ICC's library and museum. Thank you for your support and we look forward to seeing you! The Irish House Restaurant serves dinner from 5:00 to 9:00 pm – please call 413-342-4358 for reservations. The ICC invites you to an evening with the Young Dubliners, one of the most acclaimed and quite possibly Celtic rock’s hardest working band. This is a rare New England appearance for the Young Dubliners, and a special opportunity to see one of the most exciting bands in Celtic rock today. The Young Dubliners perform on Friday, August 11 at 8:00 pm at the Holyoke Elks Lodge, 250 Whitney Ave, Holyoke, MA. Doors open at 7:00 pm. Cash bar is available. Tickets are general admission, table seating. Cost is $18 for ICC Patrons, $20 for general public, $25 at the door. Receive a 10% off coupon for the ICC’s new Irish House Restaurant with each ticket purchased. Tickets are available online or by calling the Irish Cultural Center at 413-333-4951. Learn more about this event! Folk singer and balladeer Dan Ringrose provides live Irish music on Saturday, August 12 from 7:00 – 10:00 pm in the ICC's Trinity Pub. Dan was raised on the music of Irish folk legends The Clancy Brothers and Tommy Makem. He has been performing professionally throughout the region and beyond for over thirty years, delighting audiences with stories, poetry and songs of the Emerald Isle. The Irish House Restaurant serves dinner from 5:00 to 9:00 pm – please call 413-342-4358 for reservations. This week's Celebrity Bartenders – the ICC's own Jeanne Ahern and Mary Ellen Lowney! Both are ICC Board Members - Jeanne has worked for Congressman Neal for 30 years, and Mary Ellen is a professor at AIC, and a former journalist for the Springfield Daily News and The Republican. These lovely ladies will be serving drinks and assisting in-house bartenders with hospitality on Thursday, August 17 from 5:30 – 7:30 pm, at the ICC's Trinity Pub. Come join your friends – they will wait on you! Any tips or donations made to these bartenders will be used to help finish building the ICC's library and museum. Thank you for your support and we look forward to seeing you! The Irish House Restaurant serves dinner from 5:00 to 9:00 pm – please call 413-342-4358 for reservations. Live Irish music on Saturday, August 19 from 7:00 – 10:00 pm in the ICC's Trinity Pub. Jimmy McArdle, an original member of the Irish folk band The Bards, has performed with many well-known acts such as The Clancy Brothers, and The Wolfe Tones. He has also played alongside world renowned flutist James Galway at the famous Black Rose in Boston. Jimmy continues to perform in Western Massachusetts, Cape Cod, and throughout the Boston area. He often teams up with the area's finest musicians, including Bellaghy native Barney McElhone and Holyoke's accomplished accordion player Jerry Murphy. The Irish House Restaurant serves dinner from 5:00 to 9:00 pm – please call 413-342-4358 for reservations. Local favorites Don and Sheila Healy provide live Irish music on Saturday, August 26 from 7:00 – 10:00 pm in the ICC's Trinity Pub. The Irish House Restaurant serves dinner from 5:00 to 9:00 pm – please call 413-342-4358 for reservations. This week's Celebrity Bartenders are West Springfield's Fire Chief Bill Flaherty and Deputy Fire Chief Bob Manchino. These two longtime servants of West Springfield will try their hand at pouring the perfect pint, and assisting in-house bartenders with hospitality on August 31 from 5:30 – 7:30 pm, at the ICC's Trinity Pub. This contingent from the Fire Department will be taken from their comfortable spots at the bar to behind the bar. Come join your friends – they will wait on you! Any tips or donations made to these bartenders will be used to help finish building the ICC's library and museum. Thank you for your support and we look forward to seeing you! The Irish House Restaurant serves dinner from 5:00 to 9:00 pm – please call 413-342-4358 for reservations. The New Leaf provides live Irish music on Saturday, September 2 from 7:00 – 10:00 pm in the ICC's Trinity Pub. Join John Tabb, Kira Jewett and Adam Braunschweig for a night of traditional Irish music with a blend of accordion, fiddle and guitar. The Irish House Restaurant serves dinner from 5:00 to 9:00 pm – please call 413-342-4358 for reservations. This week's Celebrity Bartenders, Springfield St. Patrick’s Day Parade Committee President Kerri Sullivan and Springfield attorney and four term City Councilor Michael A. Fenton, will be serving drinks and assisting in-house bartenders with hospitality on Thursday, September 7 from 5:30 – 7:30 pm, at the ICC's Trinity Pub. Come join your friends – they will wait on you! Any tips or donations made to these bartenders will be used to help finish building the ICC's library and museum. Thank you for your support and we look forward to seeing you! The Irish House Restaurant serves dinner from 5:00 to 9:00 pm – please call 413-342-4358 for reservations. Please join the ICC and Irish government’s new Special Envoy to the United States Congress, Mr. John Deasy TD, for a conversation on current immigration law and its implications on the undocumented Irish in the region, on Saturday, September 9 at 2:00 pm. This event is free and open to the public. John Deasy has been a Fine Gael member of Dáil Éireann since 2002, representing the Waterford constituency. This visit to the ICC will be Deputy Deasy’s first trip to New England since his appointment to the important new post by Taoiseach Leo Varadkar in June. Learn more. Live Irish music on Saturday, September 9 from 7:00 – 10:00 pm in the ICC's Trinity Pub. Jimmy McArdle, an original member of the Irish folk band The Bards, has performed with many well-known acts such as The Clancy Brothers, and The Wolfe Tones. He has also played alongside world renowned flutist James Galway at the famous Black Rose in Boston. Jimmy continues to perform in Western Massachusetts, Cape Cod, and throughout the Boston area. He often teams up with the area's finest musicians, including Bellaghy native Barney McElhone and Holyoke's accomplished accordion player Jerry Murphy. The Irish House Restaurant serves dinner from 5:00 to 9:00 pm – please call 413-342-4358 for reservations. This week's Celebrity Bartenders, Simon Brighenti, Jr. and Nicholas LaPier, will be serving drinks and assisting in-house bartenders with hospitality on Thursday, September 14 from 5:30 – 7:30 pm, at the ICC's Trinity Pub. Come join your friends – they will wait on you! Any tips or donations made to these bartenders will be used towards the ICC's library and museum renovation. Simon Brighenti, Jr. is a local Attorney in West Springfield, MA. Nicholas LaPier is a local CPA, has served on many local committees, and is a United States Army Veteran. Thank you for your support and we look forward to seeing you! The Irish House Restaurant serves dinner from 5:00 to 9:00 pm – please call 413-342-4358 for reservations. Lecture "JFK Centennial: The Western Mass Connection"
Join us for a lecture on the late President John F. Kennedy’s ties to and impact on Western Massachusetts, on Saturday, September 16 at 12:00 pm, at the ICC’s Irish House Restaurant and Trinity Pub. The lecture, presented by Wayne E. Phaneuf and Anthony Cignoli, is free and open to the public. The event is co-sponsored by the Irish Cultural Center and the Springfield Museums. Phaneuf is a noted author, local historian and Springfield Republican Executive Editor. Cignoli is a political and government affairs professional. The talk will include an overview of the life of Kennedy, with specific references to his ties and visits to Western Massachusetts, where he was extremely popular. Learn more. The New Leaf provides live Irish music on Saturday, September 16 from 7:00 – 10:00 pm in the ICC's Trinity Pub. Join John Tabb, Kira Jewett and Adam Braunschweig for a night of traditional Irish music with a blend of accordion, fiddle and guitar. The Irish House Restaurant serves dinner from 5:00 to 9:00 pm – please call 413-342-4358 for reservations. This week's Celebrity Bartenders, Margaret Boyle and Liz Quigley, will be serving drinks and assisting in-house bartenders with hospitality on Thursday, September 21 from 5:30 – 7:30 pm, at the ICC's Trinity Pub. Come join your friends – they will wait on you! Any tips or donations made to these bartenders will be used towards the ICC's library and museum renovation. Margaret and Liz are both aides to Congressman Richard Neal. Thank you for your support and we look forward to seeing you! The Irish House Restaurant serves dinner from 5:00 to 9:00 pm – please call 413-342-4358 for reservations. Local favorites Don and Sheila Healy provide live Irish music on Saturday, September 23 from 7:00 – 10:00 pm in the ICC's Trinity Pub. The Irish House Restaurant serves dinner from 5:00 to 9:00 pm – please call 413-342-4358 for reservations. This week's Celebrity Bartenders, Mayor Alex Morse and State Representative Aaron Vega, will be serving drinks and assisting in-house bartenders with hospitality on Thursday, September 28 from 5:00 – 7:30 pm, at the ICC's Trinity Pub. Come join the fun as our bartenders pour the perfect pint! Any tips or donations made to these bartenders will be used towards the ICC's library and museum renovation. Thank you for your support and we look forward to seeing you! The Irish House Restaurant serves dinner from 5:00 to 9:00 pm – please call 413-342-4358 for reservations. Mayor Morse has been the Mayor of Holyoke since January 2012, and is currently running for reelection. He is an active participant in reshaping and renewing the City of Holyoke. Aaron Vega is a third term State Representative for the Fifth Hampden district, which is the city of Holyoke. Join us for great entertainment with Dee Reilly on Saturday, September 30 from 7:00 – 10:00 pm in the ICC's Trinity Pub. This will be her first, but not last, music event with us. She has been playing music most of her life, starting with country, and now with the traditional, and not so traditional Irish music. Please call 413-342-4358 for reservations as seating is limited. The Irish House Restaurant serves dinner from 5:00 to 9:00 pm. Bus Trip: "Star of the Sea"
Please join the ICC on a bus trip to see Moonfish Theater’s Star of the Sea at the UMass Bowker Auditorium on Tuesday, October 3, 2017. Tickets are $42 for ICC Patrons and $47 general – round trip bus and reserved seat at the show included in this special package! For youth under age 17, the cost is $30. To reserve tickets, please call the ICC at 413-333-4951. Seats are limited – reserve today! The bus will travel from the ICC to UMass at 6:00 pm. The bus will return to the ICC after the show. Parking is available at the ICC at no charge. Star of the Sea takes place in the winter of 1847, when the famine ship by the same name is setting sail for the promised land of America with passengers whose lives and fates are more connected than any of them know. Learn more. This week's Celebrity Bartenders, Tommie Kane and Jake Tourville-Thibault, will be pouring the perfect pint and assisting in-house bartenders with hospitality on Thursday, October 5 from 5:00 – 7:30 pm, at the ICC's Trinity Pub. Come join your friends – they will wait on you! Open to the public - any tips made to these bartenders will be used towards the ICC's library and museum renovation. Please call for dinner reservations at 413-342-4358, or just join us for a cocktail. Either way, it's always a good time! Tommie Kane is a member of the huge "Kane Clan" from Westfield/Dingle. He is an active member of the Sons of Erin, a West Springfield fire fighter, and travels to Ireland like most of us travel to the grocery store! Jake Tourville-Thibault worked as a Springfield EMT until hired as a West Springfield fire fighter in 2016. We will kick off Breast Cancer Awareness Month with our Celebrity Bartending evening, on Friday, October 6. Joining us this week are Cindy Sheridan Murphy and Joanne Leary-Beaudry. They are both cancer survivors and active facilitators for breast cancer support and Living Beyond Cancer. All tips will be donated to Survivor Journeys. These evenings are always a great time! The Irish House Restaurant serves dinner from 5:00 to 9:00 pm – please call 413-342-4358 for reservations. Book Reading: "Soap Opera Confidential"
Please join us for readings from the essay collection Soap Opera Confidential: Writers and Soap Insiders on Why We’ll Tune in Tomorrow, As the World Turns Restlessly by the Guiding Light of Our Lives on Saturday, October 7 from 1:00 – 2:00 pm at the Irish Cultural Center. Free and open to the public. This special event features the book’s co-editors, Suzanne Strempek Shea (This Is Paradise) and Elizabeth Searle (We Got Him), essay contributor Tommy Shea (Dingers), and, by Skype from Co. Galway, essay contributor Nuala Ní Chonchúir (Miss Emily, Joyride to Jupiter). Learn more. The New Leaf provides live Irish music on Saturday, October 7 from 7:00 – 10:00 pm in the ICC's Trinity Pub. Join John Tabb, Kira Jewett and Adam Braunschweig for a night of traditional Irish music with a blend of accordion, fiddle and guitar. The Irish House Restaurant serves dinner from 5:00 to 9:00 pm – please call 413-342-4358 for reservations. This week's Celebrity Bartender, Pól Ó Sniadhaigh, is visiting us from Sligo, Ireland. He will be pouring the perfect pint and assisting in-house bartenders with hospitality on Thursday, October 12 from 5:30 – 7:30 pm, at the ICC's Trinity Pub. Pól has a great interest in sport and sight seeing. This year he is the resident Fulbright Irish language teaching assistant with Elms College and the ICC. Pól has spent time bartending before and is delighted to help out with such a worthy cause. Any tips from this evening will be used towards the ICC's renovation. Join the fun! For dinner reservations please call 413-342-4358. If you don't want dinner, just join us for a cocktail. This event is open to the public. We will be hosting our second Celebrity Bartenders evening in support of Breast Cancer Awareness Month on Friday, October 13, from 5:30-7:30 pm. Joining us this week are Kim Gaughan and Sue Martin, both breast cancer survivors. All tips will be donated to Survivor Journeys. This event is open to the public. If you would like to have dinner please call for a reservation: 413-342-4358. If you would just like to join us in support of this wonderful cause, you are more than welcome. We look forward to all that come. Kim works as a Loan Administrator at Common Capital in Holyoke, and has been married to her high school sweetheart John for 32 years. She also has two adult children and two beautiful grandsons. Kim struggled with breast cancer in 2010, underwent surgery and radiation, and is now cancer free. Kim said she’s “so happy to support the fundraiser for Survivor Journeys and all the great work they do to help others." Sue is another proud Holyoke native, married to her husband Scott for 23 years, and a mother of three amazing teenage boys. She’s been working at the Holyoke Dental Associates for the past 33 years. Prior to her cancer journey in 2015, Sue was a marathon runner and never thought she would cross paths with this horrible disease. She underwent multiple surgeries and chemotherapy and is now a cancer survivor. The Cabeys provide live Irish music on Saturday, October 14 from 7:00 – 10:00 pm in the ICC's Trinity Pub. The Cabeys are a long standing local trio playing traditional Irish favorites as well as contemporary Celtic. The Irish House Restaurant serves dinner from 5:00 to 9:00 pm – please call 413-342-4358 for reservations. The ICC’s Annual Breakfast is a great opportunity to meet and mingle, with good food, pleasant company, and a review of the year’s activities. Please join us on Sunday, October 15 at 10:00 am at the ICC at 429 Morgan Road in West Springfield. Tickets are $18 for ICC Patrons and $22 for the general public. Please call the ICC at 413-333-4951 for more info or to order tickets. Or download and mail in the order form. Tickets will not be sold at the door. Dr. Mary C. Kelly, our featured speaker, will share her findings on the topic “From Irish-American to American-Irish: The Irish Question and the Ethnic Identity, 1919-1922.” Learn more. Join us for great entertainment with Dee Reilly on Saturday, October 21 from 7:00 – 10:00 pm in the ICC's Trinity Pub. She has been playing music most of her life, starting with country, and now with the traditional, and not so traditional Irish music. Please call 413-342-4358 for reservations as seating is limited. The Irish House Restaurant serves dinner from 5:00 to 9:00 pm. Folk singer and balladeer Dan Ringrose provides live Irish music on Saturday, October 28 from 7:00 – 10:00 pm in the ICC's Trinity Pub. Dan was raised on the music of Irish folk legends The Clancy Brothers and Tommy Makem. He has been performing professionally throughout the region and beyond for over thirty years, delighting audiences with stories, poetry and songs of the Emerald Isle. The Irish House Restaurant serves dinner from 5:00 to 9:00 pm – please call 413-342-4358 for reservations. The New Leaf provides live Irish music on Saturday, November 4 from 7:00 – 10:00 pm in the ICC's Trinity Pub. Join John Tabb, Kira Jewett and Adam Braunschweig for a night of traditional Irish music with a blend of accordion, fiddle and guitar. The Irish House Restaurant serves dinner from 5:00 to 9:00 pm – please call 413-342-4358 for reservations. Join us on Friday, November 10 from 7:00 – 10:00 pm in the ICC's Trinity Pub, for "A Little Dicey with Zoe Darrow” – an acoustic trio from Northampton, MA made up of three members from the Celtic Rock/Alt-Irish six piece electric band Dicey Riley. They will be playing acoustic versions of songs from Dicey Riley’s repertoire and many other songs that they bring out for these acoustic shows. Little Dicey will play some traditional music, originals, originals derived from traditional works, and acoustic covers of Celtic rock music. The band is: Timmy O'Brien playing acoustic guitar, Zoe Darrow singing and playing fiddle, and John McLaughlin singing and playing the cajón (the box drum), the bodhrán (the Irish drum) and the djembe (an African drum). Zoe is, as many in western New England already know, is a phenomenal Celtic fiddle player but what will be become evident on seeing a Little Dicey show is that Zoe is also an extremely talented vocalist. This event is open to the public. Please call 413-342-4358 for reservations as seating is limited. The Irish House Restaurant serves dinner from 4:30 to 9:00 pm. Join us for great entertainment with Dee Reilly on Saturday, November 11 from 7:00 – 10:00 pm in the ICC's Trinity Pub. She has been playing music most of her life, starting with country, and now with the traditional, and not so traditional Irish music. Please call 413-342-4358 for reservations as seating is limited. The Irish House Restaurant serves dinner from 4:30 to 9:00 pm. House of Hamill will perform on Sunday, November 12 at 3:00 pm at the ICC’s Irish House Restaurant and Trinity Pub at 429 Morgan Road, West Springfield, MA. Doors open at 2:00 pm. Tickets are limited for this intimate event. Advance purchase is highly recommended. Cost is $15 for ICC Patrons, $18 for general, $20 at the door. Tickets are available online or by calling the ICC at 413-333-4951. When purchasing tickets, please give a name for your party and indicate how many people will be seated in your party. The Irish House Restaurant’s menu and bar will be available before and during the show. Learn more about the show! We have 3 Celebrity Bartenders on November 16, from 5:30 – 7:30 pm – Janis Sawyer, Erin Panteleakis, and Shamis White. All three work at the West Springfield High School. Janis and Shamis have worked with the ICC at WSHS for 3 years and organized the student trip to Ireland in 2016. They are currently in the planning stages of another trip in conjunction with the ICC. They will be chaperoning 27 students when they travel to Ireland in April 2018. We are very pleased to have them join us at the Trinity Pub. If you would like to make dinner reservations please call 413-342-4358. Or if you would just like to join us for a drink, good times, and to support the ICC please just come on down. This is open to the public, all are welcome. Folk singer and balladeer Dan Ringrose provides live Irish music on Saturday, November 18 from 6:00 – 9:00 pm in the ICC's Trinity Pub. Dan was raised on the music of Irish folk legends The Clancy Brothers and Tommy Makem. He has been performing professionally throughout the region and beyond for over thirty years, delighting audiences with stories, poetry and songs of the Emerald Isle. This event is open to the public; join us for dinner, drinks, or just to listen to Dan - it's always a good time. The Irish House Restaurant serves dinner from 4:30 to 9:00 pm – please call 413-342-4358 for reservations. The ICC is sponsoring a new Spring Tour to Ireland (May 15–25, 2018): "Visiting Dingle, Killarney and Galway – Ireland’s Three Gems." Please join us for an information session on Sunday, November 19 at 1:00 pm, in the Dooley Campus Center at Elms College (Room 207), 291 Springfield Street, Chicopee, MA. Learn more about this exciting new tour. Please join us for this special cause – it is sure to be an amazing evening. This event is open to the public, and we would love to have a huge turn out for them. If you would like to have dinner, please be sure to call for reservations: 413-342-4358. If you would just like to show support for the Special Olympics, you are more than welcome to join us. Lynn McCarthy, Local Program Coordinator for the West Springfield Special Olympics, organizes the local sports programs for local Special Needs children and adults. Lynn started a West Side Special Olympics soccer team when it was realized that the special needs children and especially her daughter Sarah, had no local options of a team for them to participate in with so many sports programs around us in town. This was back in 1998, and since then, West Springfield Special Olympics has grown and now serves about 60 children and adults, mostly from West Springfield but we also serve surrounding towns. Lynn says, "All year, we offer various sports - in the fall we have 2 Flag Football teams and a Cheerleading squad, followed by 4 basketball teams in the winter, and 3 softball teams in the summer. We must fundraise for our own teams – buses to events when needed, uniforms, jackets, equipment and various other items. Some of the coaches have also been coaching close to 10 plus years with West Side Special Olympics - they are great mentors and leaders to the teams!" Head Coaches are: Leslie Girand, Ginny McMullan, Peachy Valentino, Jon Norton, Jim Sheridan, Kristina Albano, Sarah Kennedy. Assistant coaches are: Jack Twaddle, Nick Fenney, Jason Paine, Kathryn Manley, Alysha Lewis, Jim Uszynski, Chris Aberdale, Assistant Coach Stephani Peabody, and 1st Assistant Coach Shelly Fortier. We are pleased to have Tim and Cindy join us at the Trinity Pub again on Friday, November 24 from 6:30 – 9:30 pm. Always an entertaining evening. This event is open to the public. The Irish House Restaurant serves dinner from 4:30 to 9:00 pm – please call 413-342-4358 for reservations. Local favorites Don and Sheila Healy provide live Irish music on Saturday, November 25 from 6:00 to 9:00 pm in the ICC's Trinity Pub. The Irish House Restaurant serves dinner from 4:30 to 9:00 pm – please call 413-342-4358 for reservations. If you would just like to come in for a drink and enjoy the music, all are welcome. Don’t miss Leo and Paul's performance in the Trinity Pub on Thursday, November 30 from 6:00-9:00 pm. Please call 413-342-4358 to reserve your table for a delightful evening of entertainment. This event is open to the public - all are welcome for a great time. Born in Derry City, Northern Ireland, Leo Doherty is an accomplished singer who came to the United States in 1957. He grew up in a very musical family and as a young man he began his career in show business as the front man/star of the famous Johnny Quigley Show Band based in Derry. When he immigrated to America, he took his beautiful voice and showmanship with him and became the lead singer with the popular Springfield-based Shamrocks of Kerry band. To this day Leo enjoys performing and his love and pride of his native country shines through in every note he sings. For many years Leo Doherty has delighted audiences far and wide and his delivery of Irish and American classics is second to none. Often compared to the famous American crooners Frank Sinatra and Tony Bennett, he sings every song from his heart and when you leave a Leo Doherty performance you are sure to feel happy, entertained, and wanting more. Paul Grzebieniowski is an amazingly talented musician/accordionist who can play just about anything you may request. The Cabeys provide live Irish music on Saturday, December 2 from 6:00 – 9:00 pm in the ICC's Trinity Pub. The Cabeys are a long standing local trio playing traditional Irish favorites as well as contemporary Irish tunes with a bit of a kick. The Irish House Restaurant serves dinner from 4:30 to 9:00 pm – please call 413-342-4358 for reservations. Spend an afternoon of contemporary and Celtic rock-influenced fiddle and string music with The Moxie Strings. Diana Ladio, Alison Lynn and Fritz McGirr’s polished, high-energy shows and unique sound are redefining strings’ role in contemporary music. The Moxie Strings compose the majority of their instrumental pieces and arrange melodies from many traditions, resulting in a genre-blurring blend of ear-catching melodies and foot-stomping rhythms. The Moxie Strings will perform on Sunday, December 3 at 3:00 pm at the ICC’s Irish House Restaurant and Trinity Pub at 429 Morgan Road, West Springfield, MA. Doors open at 1:30 pm. Tickets are limited for this intimate event. Advance purchase is highly recommended. Cost is $15 for ICC Patrons, $18 for general, $20 at the door. Tickets are available online or by calling the ICC at 413-333-4951. When purchasing tickets, please give a name for your party and indicate how many people will be seated in your party. The Irish House Restaurant’s menu and bar will be available before and during the show. Learn more about the show! Liam Geddes has a wealth of experience singing on live television. He was sang on live TV in Ireland for numerous song competitions including ‘You're A Star’, ‘Euro-song,', and in 2012 he made it to the semi-final of ‘The Voice Of Ireland’ on RTE. He was mentored by ex-Westlife band member, Kian Egan. He will make a special appearance at the ICC's Trinity Pub on Thursday, December 7 from 6:30 – 9:00 pm. This event is open to the public; join us for dinner, drinks, or just to listen. The Irish House Restaurant serves dinner from 4:30 to 9:00 pm – please call 413-342-4358 for reservations. After departing 'The Voice,' Liam threw himself into the live music scene and has been very busy performing all over Ireland and parts of Europe with his acoustic guitar, or his number one instrument – the piano. He also regularly performs his original music with his live band at the world famous Whelans Live Music venue in Dublin. Liam is always busy writing new music, and has co-written with many other artists including a collaboration with Dublin-based rappers Class A’z . Their collaboration single ‘Lifeboat’ became a huge hit and was played on radio stations across the country. In 2015 Liam and his band released two singles in Ireland and their debut EP titled 'Human.' The EP shot straight to no.1 on the iTunes album charts. Please join us for dinner and festive holiday cheer, with Christmas carols and holiday music at the Irish House Restaurant and Trinity Pub on Friday, December 8. Holyoke High School’s Madrigal Singers and Bell Ringers will perform at 5:30 pm. Open to the public. Seating is limited - to make a dinner reservation, please call 413-342-4358. *Update - Unfortunately due to many members having the flu, the American International College Theater Department's Christmas Carolers will not be performing tonight at 7:30. We hope they feel better soon! Folk singer and balladeer Dan Ringrose provides live Irish music on Saturday, December 9 from 6:30 – 9:00 pm in the ICC's Trinity Pub. Dan was raised on the music of Irish folk legends The Clancy Brothers and Tommy Makem. He has been performing professionally throughout the region and beyond for over thirty years, delighting audiences with stories, poetry and songs of the Emerald Isle. This event is open to the public; join us for dinner, drinks, or just to listen to Dan - it's always a good time. The Irish House Restaurant serves dinner from 4:30 to 9:00 pm – please call 413-342-4358 for reservations. Live Irish music on Saturday, December 16 from 6:30 – 9:30 pm in the ICC's Trinity Pub. Jimmy McArdle, an original member of the Irish folk band The Bards, has performed with many well-known acts such as The Clancy Brothers and The Wolfe Tones. He has also played alongside world renowned flutist James Galway at the famous Black Rose in Boston. Jimmy continues to perform in Western MA, Cape Cod, and throughout the Boston area. He often teams up with the area's finest musicians, including Holyoke's accomplished accordion player Jerry Murphy. This event is open to the public. Join us for a drink, dinner and a good time. The Irish House Restaurant serves dinner from 4:30 to 9:00 pm – please call 413-342-4358 for reservations. Come join us for some great entertainment with Dee Reilly on Sunday, December 17 from 4:00 – 7:00 pm. She has been playing music most of her life, starting with country, and now with the traditional, and not so traditional Irish music. It is our pleasure to have her here with us. Please call for reservations, 413-342-4358. This evening is open to the public. Come join us for a drink, dinner, and great music. If you would like to join us for dinner, please call 413-342-4358 for reservations, or if you would just like to join us for the music and a drink, you are more than welcome. Jerry Murphy is a well-known and highly regarded accordion player. Jerry has played with a number of local, national, and international artists and bands during his 35 year career. In addition to his musical talents, Jerry is a retired champion step dancer. A multiple New England Champion, Jerry competed in a number of prestigious national and international competitions, most notably the All-World Championships in Ireland. Danny Cassidy, a talented multi-instrumentalist hailing from North Attleboro, MA is a proverbial “one man band.” With a 40 year career specializing in Irish and country music, there is nary a tune that Danny can’t play. Western MA is fortunate to have this special one night appearance of a true talent. Mike Rosemond is a drummer and vocalist originally from Tewksbury, MA. He played in a number of bands in the Boston area before moving to Springfield, MA. Locally, Mike has played with the Stout Porters, John Dillon, Joe Sweeney, and Jimmy McArdle. Monica Donnelly and John Flaherty will assist our in-house bartenders on December 23. All of their tips will go to help support West Springfield Junior Girl Scout Troop #21174. This event is open to the public, and we would love to see a big turn out to help them out. Please call for dinner reservations, 413-342-4358, or just join us for raising money for a good cause. Monica Donnelly grew up in West Springfield and still resides in town with her husband and her 2 children. She currently works at Liberty Mutual Insurance Company and spends her free time coaching her daughter’s sports, volunteering for Operation Santa, and leading the Junior Girl Scout Troop, among other volunteer opportunities. West Springfield Junior Girl Scout Troop #21174 started when the girls were in kindergarten. Going on the 5th year of the troop, these girls have formed everlasting bonds and friendships. They support and encourage one another and come up with thoughtful and innovative ideas to give back to their community. They’ve done countless community service projects and their ideas just keep coming. This will be Billy's first time playing here, and we really look forward to having him. If you would like to join us for dinner please 413-342-4358 for reservations. If you would just like to come in for a drink and great music, you are more than welcome to join us. Billy has been playing for over 20 years, from Boston to New York. He was the founding member of the Rising Band. He will be playing your Irish Pub favorites, keeping the Irish culture alive and well! Barney McElhone will be joining him that evening as well. This will be a fun time for all. This event is open to the public. Join us on Friday, December 29 from 6:30 – 9:30 pm in the ICC's Trinity Pub, for "A Little Dicey with Zoe Darrow” – an acoustic trio from Northampton, MA made up of three members from the Celtic Rock/Alt-Irish six piece electric band Dicey Riley. They will be playing acoustic versions of songs from Dicey Riley’s repertoire and many other songs that they bring out for these acoustic shows. Little Dicey will play some traditional music, originals, originals derived from traditional works, and acoustic covers of Celtic rock music. The band is: Timmy O'Brien playing acoustic guitar, Zoe Darrow singing and playing fiddle, and John McLaughlin singing and playing the cajón (the box drum), the bodhrán (the Irish drum) and the djembe (an African drum). Zoe is, as many in western New England already know, is a phenomenal Celtic fiddle player but what will be become evident on seeing a Little Dicey show is that Zoe is also an extremely talented vocalist. This event is open to the public. Please call 413-342-4358 for reservations as seating is limited. The Irish House Restaurant serves dinner from 4:30 to 9:00 pm. Local favorites Don and Sheila Healy provide live Irish music on Saturday, December 30 from 6:30 to 9:30 pm in the ICC's Trinity Pub. The Irish House Restaurant serves dinner from 4:30 to 9:00 pm – please call 413-342-4358 for reservations. If you would just like to come in for a drink and enjoy the music, all are welcome. Join us on the evening of December 31 as we ring in the New Year at 7 pm local time, with a live stream of the ball drop in Ireland at midnight Irish time! Festivities include a buffet from 5 – 7 pm, live music with Tim and Cindy starting at 6 pm, and a champagne toast at 7 pm as the ball drops in Ireland. Cost is $25 per person, and includes buffet and champagne toast. Reservations are required – please call 413-342-4358. Pub will be open from 3 – 10 pm. Learn more. *Update: We are completely booked for our first New Year’s Eve from Ireland. We are taking names and numbers if there are any cancellations.